Combined Task Force (CTF) 151 Commander, Rear Adm. Tanin Likitawong, Royal Thai Navy, visited HMS Westminster, May 3. Rear Adm. Tanin Likitawong, commander, Combined Task Force (CTF) 151, and Officer Commanding Royal Marines (OCRM), Capt. Will Hall, Royal Marines, speaks with members of HMS Westminster. Capt. Nick Hine, commanding officer, HMS Westminster, welcomed Rear Adm. Likitawong aboard to discuss the vessel’s contribution to the counter-piracy mission. The visit familiarized Rear Adm. Likitawong with Westminster’s boarding team’s effectiveness and capabilities in support of counter-piracy operations, the primary mission of CTF 151. 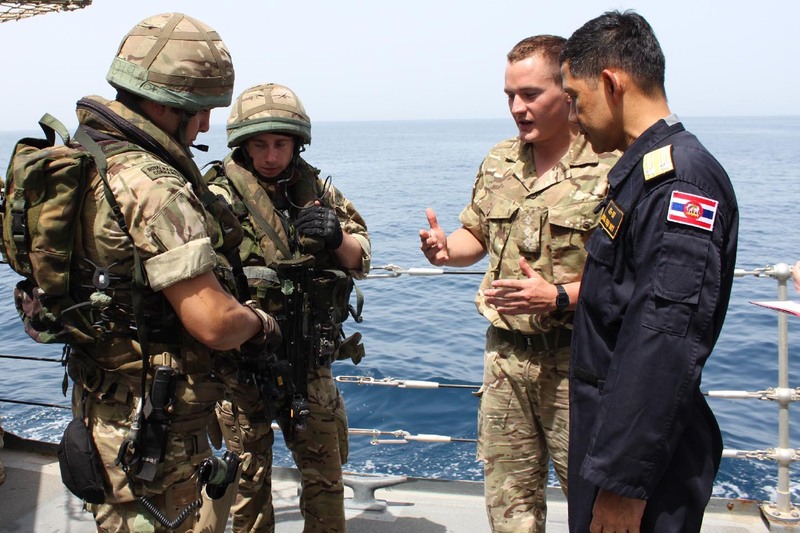 Rear Adm. Likitawong observed the boarding team training and was able to speak with some of the embarked Royal Marines about their experiences. The Royal Marines Boarding Team (RMBT) is comprised of an Officer Commanding Royal Marines (OCRM), a sergeant as the team commander and five marines. Team members undergo rigorous commando training in addition to boarding specific training prior to deployment.